It would be 18th century references, like the 1734 Murillo Velarde map, that would debunk the “false history” China was spreading in its effort to claim Philippine territories, Supreme Court Senior Associate Justice Antonio Carpio said on Monday. “We have to correct that because that’s the false history. And the way to do that is to present old maps, ancient maps, because they don’t lie,” Carpio said on GMA 7 news program “24 Oras”. “We should be proud that we have the oldest map showing the Spratlys and the Scarborough shoal as part of Philippine territory,” he added. The 17th century map played a significant role in the Philippines’ victory in its arbitral tribunal case against China. It features the Bajo de Masinloc or Scarborough Shoal that was labelled as “Panacot”, as well as the “Los Bajos de Paragua” later known as the Spratlys islands. “This map is very persuasive to support our claim on these territories, for the simple reason that when this map was made, there was no issue yet on who owned these islands,” added Atty. Felipe L. Gozon, Chairman and CEO of GMA Network Inc. – the first and only media company to receive an official replica of the artifact. It was purchased for P12 million by businessman and educator Mel Velarde, who also chairs the Asian Institute of Journalism and Communication. “What they produce is, it’s really the Google Earth of the 17th century. Plus, there are vignettes here that show you pictures of the life of the Indios and the Europeans and the Asians here in the Philippine islands during that time,” so each part of this map really has a story to tell,” Velarde said. 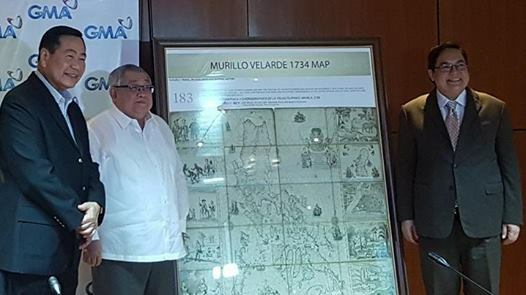 Velarde donated the 300-year-old map to the government. It will soon be on public display at the Manila-Acapulco Galleon Museum in Pasay City. The Impossible will give up.